Pigeons can be sly, sneaking up with a gentle reassuring coo before they peck at the crumbs at your feet. They can be fierce flighty things that bunch together before launching upwards like grey rain clouds. They always seem to be ahead of the game, ready to step back as you advance or lunge forward as soon as you retreat. But it’s possible to catch them unawares. 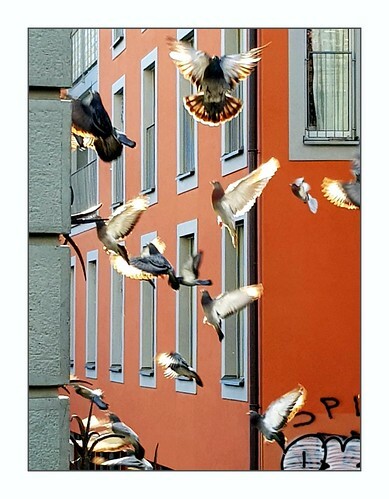 You turn a corner and catch them mid-flutter, scattering in different directions, their bodies haloed by the sun. Enjoying an innocent moment before they turn their attention back to the tourists gathering in the town square.